After getting a bit of experimentation out of my system, I’m trying to focus on hammering out an inventory of staple flies for this winter season first, and then will get to the variety needed for the spring and summer months. First, I’m going to empty out the nymph side of my fly box and start from scratch. I haven’t built up the courage to do it quite yet, but it should force me to keep putting time in at the vise to fill the rows with fresh flies. 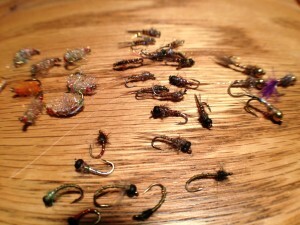 Holy cow, what a disheveled, unorganized mess of truly crappy flies. I’m looking forward to a fresh start here. So far, the basics covered and tied have been orange (necessary) and rainbow (experimental) scuds, midges, and small pheasant tails, along with a few larger attractor nymphs. 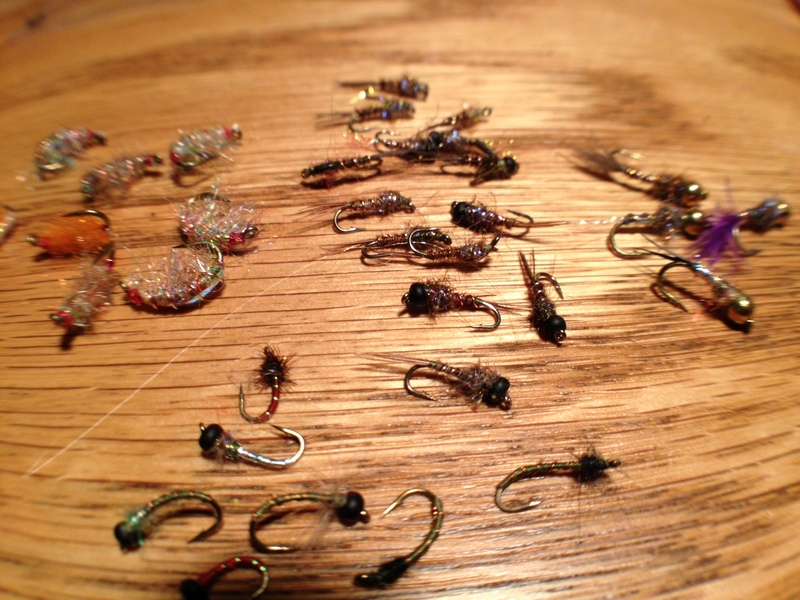 I bought some rainbow scud dubbing at Dan Bailey’s fly shop this past summer and am looking forward to see how they work. By the way, I pulled this pair out of the size 18 hook box…the company must be trying to find a way to force me to de-barb my hooks at this vise. 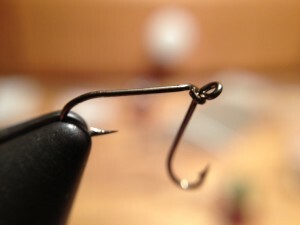 The next crappy fly on my list to tie is Prince Nymphs. Man, I hate tying on biots and apologize in advance for any gratuitous cursing from my basement. 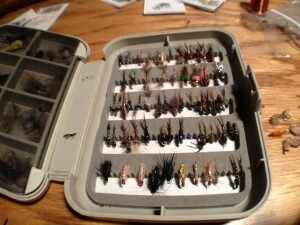 If I can accomplish this goal, I may reward myself with a new fly box, because who doesn’t like new things? This entry was posted in fly tying on January 7, 2013 by Randy.